The Lyons have officially met their match in Eddie Barker. 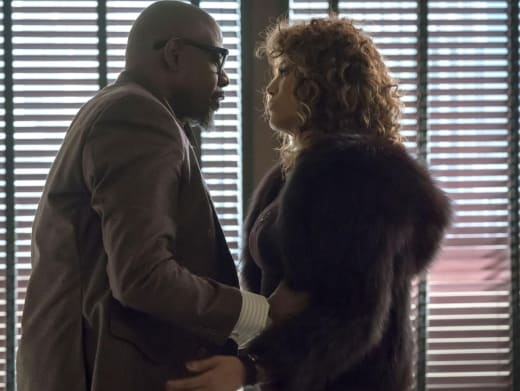 If Empire Season 4 Episode 17 proved anything, it's that the scheming is showing no sign of letting up, and that's exactly what I expect of a primetime soap opera. Eddie is a formidable opponent, and he may well be the series' best villain yet. He knows Lucious on both a personal and professional level and knows that he will resort to shedding blood if he needs to do it. Giselle is just as crafty as Eddie, and if these are the two that ultimately knock the house of cards down on the Lyons, then I'd be quite okay with that. Both sides gave as good as they could get. The only major issue with this uprising against the Lyons is that there's no space for Anika in that boardroom. She's like a cartoon villain who always pops up to try and get some money. Cookie's analogy about the crabs was cruel, but it's probably the best way to describe Grace Byers' tenure on the show. There's nothing new to do with the character, and she does not fit the narrative any longer. It's pitiful that the writers are so intent on keeping her around that they're prepared to portray her as a woman who is just doing what she can to survive. I can't be the only one not buying this schtick. Oh, how I would love if there was a miraculous discovery and Anika's DNA was linked to Shine's death. There was no way Shine was going to die in vain, so this was always going to pop back up. I'm not sold on Giselle managing to pay off Lucious' henchmen. His nearest and dearest know the true extent of his rage and that there would be something in the way of pushback. The more likely scenario is that the scarf Eddie and Giselle have in their possession is fake, they've taken a big swing at the Lyons, and it's worked. Andre's part in all of it was ridiculous. The plot would have been tighter if Andre had not already admitted to his family ages ago that he was going to find a way to redeem himself for his part in the bombing. Andre has been on a path to redemption, so the very notion that he was going to defect from his family again left a bad taste in my mouth. Also, Andre was stupid to think that those numbers were just going to be lying around. The eldest Lyon sibling made a big blunder by sending the images because it was all too easy. Eddie and Kelly had all their bases covered, and that was solidified when the paywall was taken down, and they still won. I couldn't help but laugh at Tiana revealing just how thirsty she was the board meeting. 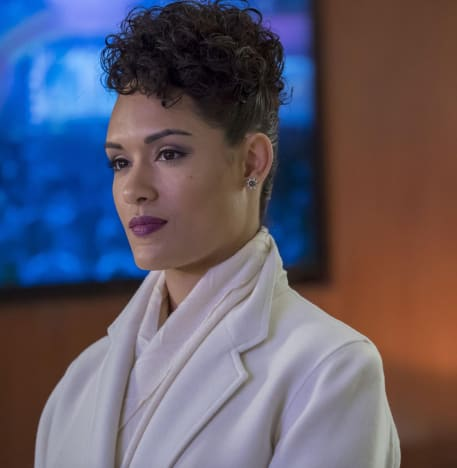 She's a mere puppy for Eddie as he tries to take the Lyons down, and I hope her contract is shredded when the Lyons inevitably regain control. It was oddly satisfying when Hakeem welcomed his new girlfriend to the stage. Like, what world was Tiana living in to think that Hakeem would ever be like that with her again? There's too much bad blood between them now, so it's time to nip this relationship in the bud. They've been going back and forth a little too much over the last four years for me to care. Yes, it's clear that they still love each other, but there's an element of toxicity in their relationship that makes it difficult to get on board with their love story. The anonymous band unveiling who they were was a tremendous dud. I like the element of surprise with them, and that was because nobody knew who they were. They had no rules they had to follow, so having their identities out there so soon felt like everything they stood for was questioned. Tori was right that she would never ask Jamal to do the same thing. It would have flowed much better if they performed in disguise. In fact, it would have probably sent the money, and the streams soaring even higher as the world got a glimpse at the number of them. Alas, "Bloody Noses and Crack'd Crowns" was a bit all over the place. The series is falling back into its old ways, and it's starting to undo all the good. Empire has always struggled with consistency, and it's a shame to see it falling apart at the end of the season. 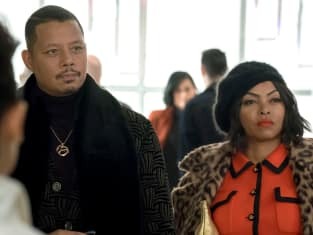 Hopefully, the season finale can give the series another jolt in the right direction, but my one true wish is that Lucious does not go to prison. It's a tired old trope because we know he'll be back out a few episodes later. What are your thoughts on the latest developments? Remember you can watch Empire online right here via TV Fanatic. 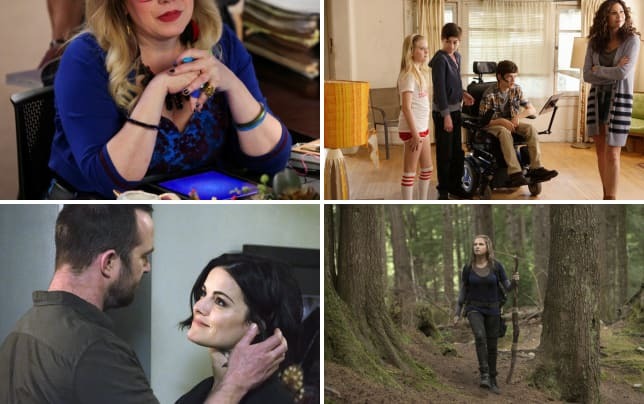 Get caught up with all the latest developments right now! Empire continues Wednesday at 8/7c on Fox.